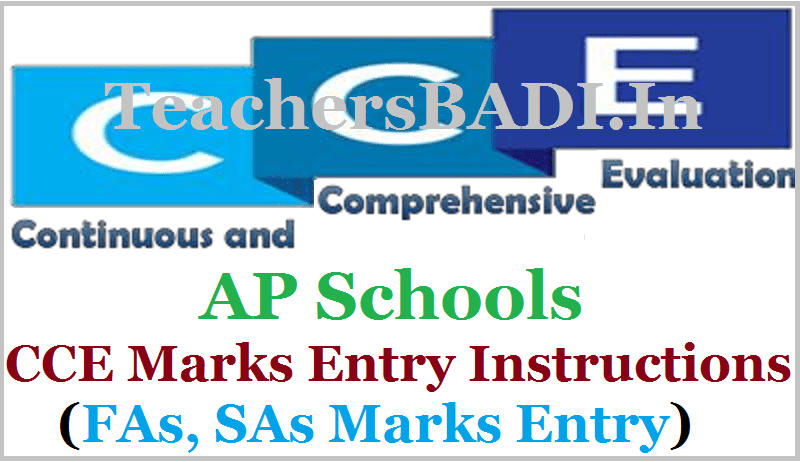 AP School CCE Marks Entry on http://cse.ap.gov.in/DSE/, AP Schools FA1, FA2, SA1, FA3 & SA2 Marks Entry Instructions, Formative Assessment and Summative Assessment Marks/Grades entry instructions, Enable Option at CSE AP Web portal for CCE Marks entry, FAs,SAs Marks Entry. Rc.No.109,Dt.10.03.2017; Sub: School Education - CCE Marks Entry - Certain Clarifications raised by the School Managements - Clarifications issued - Reg. www.cse.ap.gov.in: AP Department of school education portal www.cse.ap.gov.in was developed to bring all information related to education on a single platform. It was desired to monitor all data to make education an ennobling experience. Various measures are being taken to enhance the performance of the students. One such measure is Continuous Comprehensive Evaluation. Hence it is desired to develop an application to capture performance of the students in four formative tests and three summative exams. To monitor the performance of the students in all the formative and summative exams and take corrective measures wherever required. The scope of this document is to explain the process flow for updating end user usage. There are two services to be updated.1. Student Second Language Mapping - Students have to be mapped to their second language and composite language. 2. Academic Performance Monitoring - Marks of each student to be entered for each exam. Maximum marks for each exam need to be identified. The system will not allow you to enter marks greater than the maximum marks. All the District Educational Officers are informed that there are certain issues raised by various school managements pertaining to data entry of CCE Marks, Some schools have informed about wrong language mapping for certain students a few private school managements have raised the issue of wrong marks entry. After examination of the above constraints with the Director, SCERT the following orders are issued. As per the meeting held with Commissioner of school Education, Director SCERT, PMU and AP Online, decided to give an opportunity for the schools who have not entered the marks for the assessments with some limitations so please find the attached copy of more instructions and clarifications. So please do utilise the opportunity without fail and give instructions to the concerns. Provision will be given to enter the marks of all students, whose marks are not entered in any assessments till date (i.e. FA1, FA2, SA1, FA3 & SA2). This window will be opened from 13th March, 2017 to 17th March, 2017 till 5:00 PM. CCE marks entry service for all students, whose marks are not entered in any assessments till date (i.e. FA1, FA2, SA1, FA3 & SA2) is enabled for all managements in CSE portal other than below managements. Managements such as State Govt, KGBVs, Municipal, AP Model and MPP_ZPP Schools on the above may approach their respective MEOs to get the CCE marks entry done at the APOnline centres. This service will remains open from 13th March, 2017 to 17th March, 2017 till 5:00 PM.